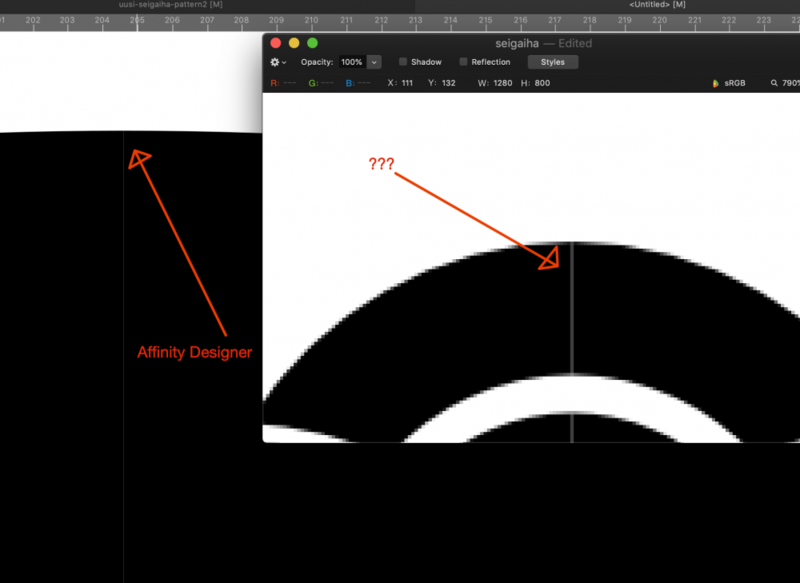 I am trying to create a continuous pattern with Affinity Designer. I have created connecting tiles, but when I put them next to each other, the border is rendered in pixel export. The shapes are positioned so that they have the same cordinates in document. See attached picture. Is there a way to join two shapes so that there is no line between them? I managed to do this before in Illustrator. I'm hoping to do this in Affinity Designer also. ...And I found a possible reason for this My shape does transform to exact pixels. Maybe I should try to join the tiles in pixel persona. You could try using the 'Add' button on the top toolbar (Also done via Layer > Geometry > Add) with the two objects selected. Alternatively you could overlap them some more. Unfortunately this can happen if you're objects aren't correctly pixel aligned as you mentioned. You can check your output by changing to Pixel View Mode from View > View Mode - this will show your objects in pixels which will reveal issues like above. I have this issue as well. I used the divide tool to split a rectangle into multiple triangles. The exported pdf image creates an unacceptable line between objects — as seen in the embedded image. Please help fix this issue.